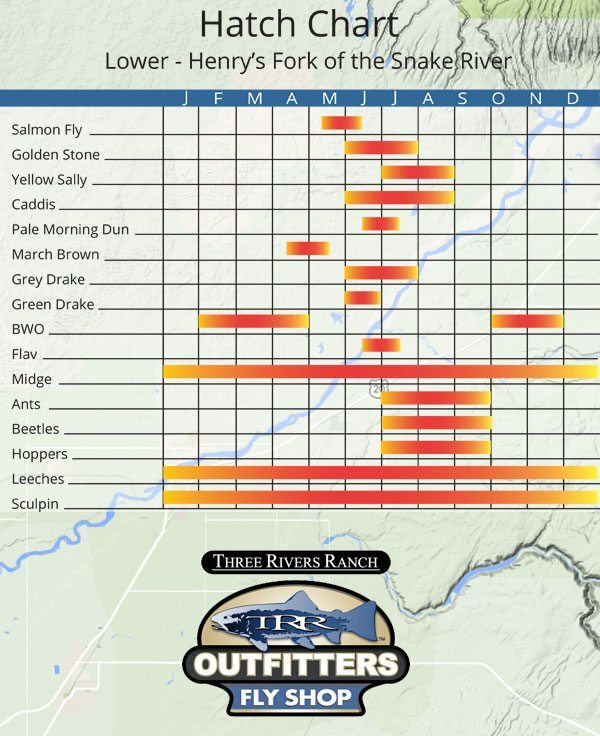 This Henry’s Fork Hatch chart is specifically for the lower stretch of the river. If you’re getting ready to fish from Ashton Dam down river, you are in the right place! If you’re going to fish Island Park head over to our Upper Henrys Hatch Chart. A lot of places will try to truncate the river into one river. That’s fine, but the Henry’s Fork is too diverse of a river to do just that. Below Ashton is a really different river from Island Park down to Ashton. Of course, the charts are only a guide. Each year will vary slightly, depending on a bunch of conditions. Give us a call if you need advice on the exact bug that will get that tug you’re looking for. Take a look at this interactive map of the Warm River to Ashton Float.